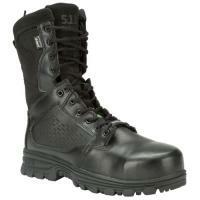 511 Tactical EVO 8" CST Boot (12354) FREE SHIPPING! The 5.11 Tactical EVO 8" CST Boot provides an impressive level of coverage and protection, optimizing its wearability in hostile tactical environments. The Nubuck and pebbled leather upper deliver extreme durability and puncture-resistant strength, while the addition of a composite safety toe offers foot protection in the case of falling objects. The EVO Cupsole platform, full-length EVA midsole and nylon shank guarantee stability and foot support, while the OrthoLite® insole ensures the foot is well-cushioned for longterm wear. The EVO's oil and slip-resistant sole is built for all-terrain traction, including climbing lugs for versatile agility. The 14-millimeter heel-to-toe drop keeps feet at a prime stance for efficient running and enhanced performance. 5.11 includes convenient sausage laces and genuine YKK® side-zip closures for secure wear and quick on/off. ©2002-2019 CopsPlus.com: 511 Tactical EVO 8" CST Boot (12354) FREE SHIPPING!